Structural studies of biological macromolecular assemblies are providing an understanding of cellular function. In our laboratory, we utilize electron microscopy and image reconstruction to investigate questions about how adhesion pili aid pathogenic bacterial survival under harsh physiological conditions. 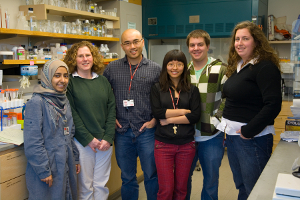 Work in the lab currently focuses on bacterial adhesion pili and poliovirus polymerase. These projects address basic medical research questions directed at understanding bacterial adhesion to human host tissue and viral replication. Our data support development of novel therapeutics targeting these important health issues including, for example, development of a vaccine against traveler’s diarrhea.